If your tomato plants yellow and wilt on one side of the plant or one side of a leaf, they may have Fusarium wilt. 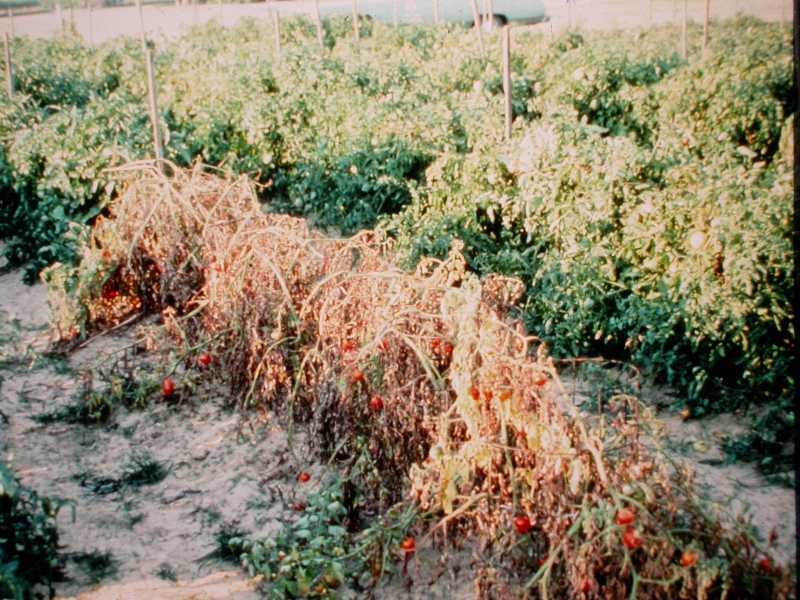 Fusarium wilt on tomatoes is caused by Fusarium oxysporumsp. lycopersici. It is a soilborn fungus that is found throughout the United States, especially in warm regions of the country. The organism is specific for tomato and is very longlived in all regions of the United States. The disease develops more quickly in soils that are high in nitrogen and low in potassium. In addition, plants grown in sandy soils tend to contract this disease more often. Fusarium often causes yellowing on one side of the plant or leaf. Yellowing begins with the older, bottom leaves, followed by wilting, browning, and defoliation. Growth is typically stunted, and little or no fruit develops. Brown, vascular tissue can be found when the infected stem is cut at its base. Infected plants often die before maturing. Fusarium fungi survive in the soil or associated with plant debris for up to ten years. 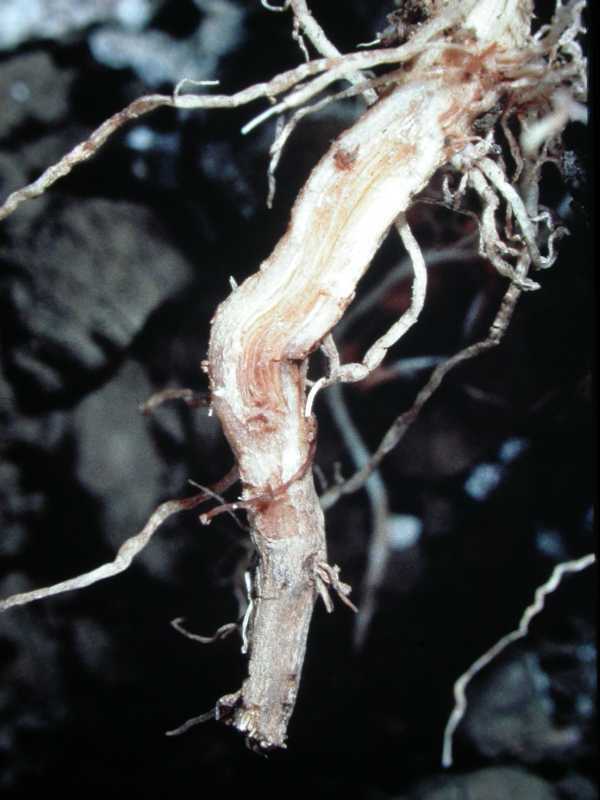 Disease development is favored by warm soil temperatures, and symptoms are most prevalent when temperatures range from 80–90 degrees F. The fungi enter the plants through their roots and are then spread throughout the plant by the plant's water-conducting vessels. 1. Plant resistant varieties. These varieties are labeled VF and include cultivars such as ‘Spring Giant’, ‘Burpee VF’, ‘Supersonic’, ‘Celebrity’, ‘Manalucie’, ‘Better Boy’, and ‘Small Fry’. 2. Remove infected plants from the garden. Removal of infected plants will help limit the disease's spread. Soil sterilization or fumigation will eliminate wilt fungi from the soil but are impractical for home gardeners. Soil replacement should be considered. 3. Avoid over-application of high nitrogen fertilizers. High soil nitrogen levels accompanied by low potassium levels can increase susceptibility to the fungus. Use a soil test to determine potassium levels and other nutrient deficiencies. 4. Avoid activity in wet plantings. Movement of wet soil from place to place via shoes or tools will spread the disease. 5. Sanitize stakes and tomato cages at the end of the season. Avoid using soil-encrusted tools and supports season after season. A thorough cleaning with water will reduce most risk of transmitting the disease. 6. For four years, do not plant solanaceous plants in the area where infection occurred. Tomato, potato, pepper, and eggplant are all susceptible to the disease and may allow its survival year after year in the same planting area. Strategies 1, 2, 4, 5, and 6 are strictly organic approaches. Using an appropriate organic fertilizer would be a viable organic approach to Strategy 3. 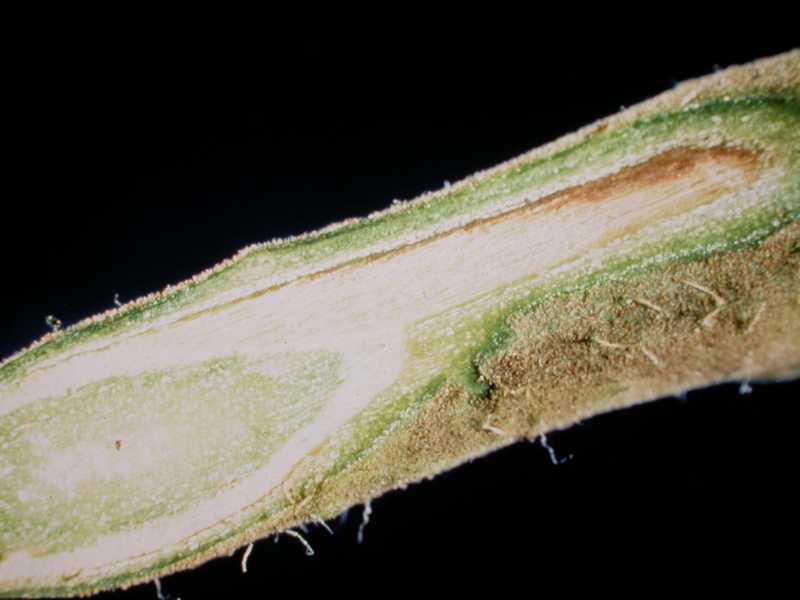 Fusarium wilt can cause brown streaking in the vascular tissue of infected plants and rotted roots.